Any attempt to summarize John McLaughlin's diverse career into a mere two CDs will be open to criticism, especially by the legendary guitarist's ardent fans. 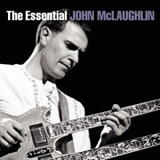 The Essential John McLaughlin is not meant to be a "best of collection, or even a representation of all the various groups he's led since his professional career began in the early 1960s, coming to greater acclaim later that decade. Instead, what this compilation attemptsand succeedsis to show just how multifaceted McLaughlin has been from the very beginning. 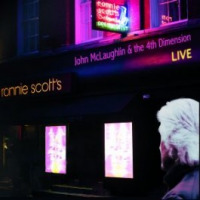 There's McLaughlin the straight-ahead jazzer on a 1963 recording of Sonny Rollin's "Doxy by British altoist Graham Bond with pre-Cream bassist Jack Bruce and drummer Ginger Baker, and his own, very swinging "Do You Hear the Voices You Left Behind? from Electric Guitarist (Columbia, 1978), featuring keyboardist Chick Corea, bassist Stanley Clarke and drummer Jack DeJohnette. And there's McLaughlin the fusion firebrand, from Tony Williams Lifetime's classic Emergency! 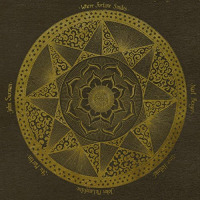 (Polydor, 1969) through to "Wayne's Way, from his technology-centric Industrial Zen (Verve, 2006), by way of legendary Mahavishnu Orchestra albums including The Inner Mounting Flame (Columbia, 1971) and Birds of Fire (Columbia, 1973) and MO Mark II's Apocalypse (Columbia, 1975). A seventeen-minute edit from Miles Davis' classic A Tribute to Jack Johnson (Columbia, 1970), is the closest to rock and roll both Miles and McLaughlin ever got. But that's only a part of this very large puzzle. 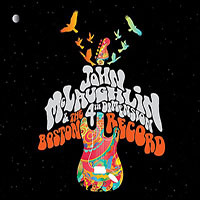 McLaughlin's longstanding interest in bringing east and west together is represented by "India, from Shakti's second album, Handful of Beauty (Columbia, 1977) and My Goal's Beyond's "Peace One, with pre-Mahavishnu Orchestra appearances by violinist Jerry Goodman and drummer Billy Cobham. McLaughlin's orchestral side is heard on the third movement of his Concerto for Guitar and Orchestra: "The Mediterranean (CBS, 1990) and Apocalypse's "Wings of Karma. 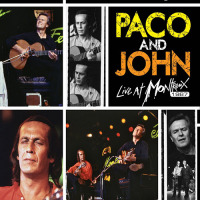 McLaughlin, acoustic guitarist, is heard on the lyrical "David, from his trio disc with Al Di Meola and Paco de Lucia, Passion, Grace & Fire (Columbia, 1983), and the elegant "Two Sisters duet with pianist Katia Lebeque, also from The Mediterranean. There's even McLaughlin the occasional banjoist on "Electric Dreams, Electric Sighs from Electric Dreams (Columbia, 1978), the sole album by his fusion-centric One Truth Band. And there's plenty more, including sideman dates with Joe Farrell and Carla Bley, and collaborations with Carlos Santana and the short-lived Trio of Doom with Tony Williams and Jaco Pastorius. While the absence of a track from his remarkable debut as a leader, Extrapolation (Polygram, 1969), does stand out, it's because of a licensing issue and not an omission by compilation producer Richard Seidel. With such a large body of work to choose from, there will be plenty of fans complaining about missing tracks and groups. 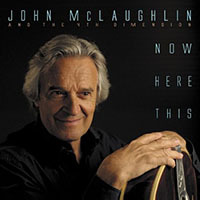 But taken as the broadest possible cross-section of this iconic artist's nearly five decade career squeezed onto two discs, The Essential John McLaughlin is close to two hours and forty minutes of vintage McLaughlinthe leader, the collaborative co-leader and the infinitely flexible yet utterly distinctive session ace. 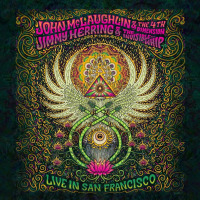 Personnel: John McLaughlin: electric guitar (CD1#1-6, CD1#9-11, CD2#1, CD2#3, CD2#4, CD2#6, CD2#8, CD2#12), acoustic guitar (CD1#7, CD1#8, CD2#2, CD2#7, CD2#9-11), guitars (CD2#5), banjo (CD2#5), Photon MIDI Interface (CD2#11), synthesizer programming (CD2#12); Graham Bond: alto saxophone (CD1#1); Jack Bruce: bass (CD1#1, CD1#6), vocal (CD1#6); Ginger Baker: drums (CD1#1); Larry Young (Khalid Yasin): organ (CD1#2, CD1#3, CD1#11); Tony Williams: drums (CD1#2, CD2#6); Billy Rich: bass (CD1#3); Buddy Miles: drums (CD1#3); Miles Davis: trumpet (CD1#4, CD2#8); Herbie Hancock: organ (CD1#4); Michael Henderson: bass (CD1#4); Billy Cobham: drums (CD1#4, CD1#8-11); Joe Farrell: tenor saxophone (CD1#5); Chick Corea: electric piano (CD1#5, CD2#3), Minimoog (CD2#3); Dave Holland: bass (CD1#5); Jack DeJohnette: drums (CD1#5, CD2#3); Carla Bley: organ (CD1#6); Paul Motian: drums (CD1#6); Dave Liebman: flute and soprano saxophone (CD1#8); Jerry Goodman: violin (CD1#8-10); Mahalajshmi: tamboura (CD1#8); Charlie Haden: bass (CD1#8); Airto Moreira: percussion (CD1#8); Badal Roy: tabla (CD1#8); Jan Hammer: keyboards (CD1#9, CD1#10), drums (CD1#11); Rick Laird: bass (CD1#9, CD1#10); Carlos Santana: electric guitar (CD1#11); Doug Rauch: bass (CD1#11); Don Alias: drums (CD1#11); Mike Shrieve: drums (CD1#11); Jean-Luc Ponty: violin (CD2#1); Gayle Moran: keyboards (CD2#1); Ralphe Armstrong: bass (CD2#1); Narada Michael Walden: drums (CD2#1); London Symphony Orchestra, conducted by Michael Tilson Thomas CD2#1, CD2#9); L. Shankar: violin (CD2#2, CD2#5); Zakir Hussain: tabla (CD2#2, CD2#12); T.H. Vinayakram: percussion (CD2#2); Stanley Clarke: bass (CD2#3); Stu Goldberg: keyboards (CD2#5); Fernando Saunders: bass (CD2#5); Tony Smith: drums (CD2#5); Alyrio Lima: percussion (CD2#5); Jaco Pastorius: bass (CD2#6); Al DiMeola: acoustic guitar (CD2#7); Paco de Lucia: acoustic guitar (CD2#7); Vince Wilburn: electric drums (CD2#7); Thomas Clausen: keyboards (CD2#7); Ole Koch-Hansen: keyboards (CD2#7); Kenneth Knudsen: keyboards (CD2#7); Bjarne Roupe: guitar (CD2#7); Bo Stief: bass (CD2#7); Niels-Henning Orsted Pederson: bass (CD2#7); Lennart Gruvstedt: drums (CD2#7); Marilyn Mazur: percussion (CD2#7); Ethan Weisgard: percussion (CD2#7); Liels Eje: oboe and cor Anglais (CD2#7); Lilian Toernqvist: harp (CD2#7); Benny Rosenfeld: trumpet and flugelhorn (CD2#7); Oakke Bolvig: trumpet and flugelhorn (CD2#7); Jens Winther: trumpet and flugelhorn (CD2#7); Perry Knudsen: trumpet and flugelhorn (CD2#7); Idrees Sulieman: trumpet and flugelhorn (CD2#7); Palle Mikkelborg: trumpet and flugelhorn (CD2#7); Vincent Nilsson: trombone (CD2#7); Jens Engel: trombone (CD2#7); Ture Larsen: trombone (CD2#7); Ole Kurt Jensen: bass trombone (CD2#7); Alex Windfeld: bass trombone and tuba (CD2#7); Jesper Thilo: saxophones and woodwinds (CD2#7); Per Carsten: saxophones and woodwinds (CD2#7); Uffe Karskov: saxophones and woodwinds (CD2#7); Bent Jaedig: saxophones and woodwinds (CD2#7); Flemming Madsen: saxophones and woodwinds (CD2#7); Katia Lebeque: piano (CD2#10); Dominique Di Piazza: bass (CD2#11); Trilok Gurtu: percussion (CD2#11); Ada Rovatti: soprano saxophone (CD2#12); Gary Husband: keyboards (CD2#12); Tony Grey: bass (CD2#12); Dennis Chambers: drums (CD2#12).